But, the global AI in healthcare market is primarily driven by growing investment by the private firms. According to the World Economic Forum, in the year 2016, around 200 artificial Intelligence based companies collectively invested in AI, collectively investing nearly $1.5 billion globally. Moreover, advancements in IT and big data capabilities along with the surging healthcare expenditure is fueling the market. Software ruled the offerings segment in terms of revenue in the Global Artificial Intelligence in Healthcare market in 2017. Further, the software market of AI in healthcare is predicted to grow at the highest rate over the forecast period. The software used in AI includes data gathering software, predictive & analytical software, and other softwares that are used to approximate human perception to analyze complex medical data and relationships between treatment or prevention technique and patient outcomes. The software market is primarily driven by high investments of big giants, such as Google Inc, in various startups for AI solution for healthcare. With increasing adoption of Artificial Intelligence (AI) in Healthcare, newer challenges have been introduced in the market. Difficulties in maintaining the data security, slow adoption of AI-Based technologies, and ambiguous regulatory guidelines for medical software are some major issues that are profoundly pulling back the Artificial Intelligence (AI) in Healthcare market. 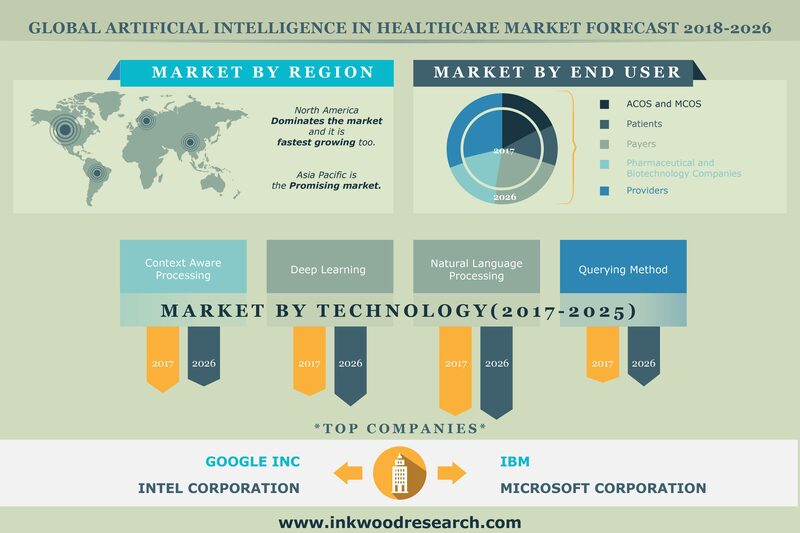 Artificial Intelligence in Healthcare North America Market: United States & Canada. Artificial Intelligence in Healthcare Europe Market: United Kingdom, France, Germany, Spain, & Rest of Europe. Artificial Intelligence in Healthcare Asia Pacific Market: China, India, Japan, Australia, & Rest of Asia Pacific. North America leads the global artificial intelligence in healthcare market by capturing the largest market share in 2017. The dominance of North America is due to the growing adoption of machine learning in the medical sector, which has consequently increased the growth of AI in healthcare market in countries such as the U.S. and Canada. Furthermore, high investments by the US government in healthcare initiatives that rely on Artificial intelligence such as Cancer Moonshot, and for Precision Medicine Initiative, are expected to boost the AI in healthcare market in this region. On the other hand, the Asia Pacific region is one of the fastest growing regional markets. Increasing healthcare expenditure, high prevalence rate of chronic & infectious diseases resulting in large pool of patients, expanding big data & Internet f Things (IoT) device market, high adoption rate of cloud computing, positive economic outlook, rising internet penetration, and government initiatives supporting the digital growth are factors driving the Asia Pacific artificial intelligence in healthcare market. The global artificial intelligence in healthcare market has been segmented on the basis of offerings, technology, applications and end users. The offering segment is segmented into software, hardware and services. Further, the technology segment includes context-aware processing, deep learning, natural language processing and querying method as sub-segments. The overall market is also segmented on the basis of applications and end users. The application segment includes drug discovery, inpatient care & hospital management, lifestyle management & monitoring, medical imaging & diagnostics, patient data & risk analysis, precision medicine research, virtual assistant and wearables. Market segment by end-users is divided into ACOS & MCOS, patients, payers, pharmaceutical & biotechnology companies and providers. Company profiles of prominent market players are discussed in detail. Most of the companies look for strategies such as merger & acquisition, partnership, contracts, agreements, and new product launch to gain a competitive edge over each other. In May 2017, GE Healthcare and Partners HealthCare signed a partnership agreement to create applications to advance patient outcomes in diagnostic imaging and productivity. The main objective is to develop new business models for artificial intelligence (AI) in healthcare. In February 2017, Microsoft announced to launch Healthcare NExT, a new initiative to transform health care. It uses intelligent technology to improve the lives of people around the world. China, Japan & India are expected to lead the Asia Pacific region to become the fastest evolving market in the coming years. The market for the Patient Data and Risk Analysis is expected to be a dominant application segment. Inorganic growth is the preferred growth path. Product launch, partnerships and agreements are the primary strategies adopted by market players to gain a competitive edge over each other.